Was taken up by me, on the mountain near Monterey about two weeks ago, a blooded Bay Mare which is supposed to have been stolen. She is between 14 and 15 hands high, with a brown spot in the right hip, dish face roan hairs at the root of her tail, trots and lopes, and had been with foal, but lost her colt. 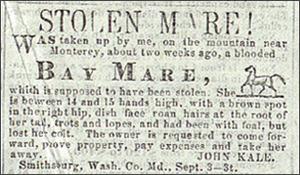 The owner is requested to come forward, prove property, pay expenses and take her away.